Kandhamal District Recruitment 2019 - Below are various recruitment notifications published by Kandhamal District, Odisha. As of now, we don't have any active recruitment notification by Kandhamal District featured here. We may update as soon as the organization announces a new job notification. 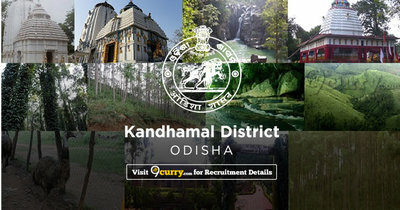 If you are looking for any information related to previously organized recruitment drives by Kandhamal District, you can browse through previous job notifications mentioned below and get the new updates or information you are looking for. Kandhamal District Recruitment 2019 - Job notification for 72 Sikshya Sahayak/ Sahayiak Posts in ST & SC Development Department, Kandhamal District, Kandhamal, Odisha on Contract Basis. Applications are invited by Kandhamal District, Odisha on or before 14 Feb 2019 05:00 PM for 72 vacancies. (a) Higher Secondary (+2 or its equivalent) with at least 50% marks and 2 year Diploma in Education (CT). Higher Secondary (+2 or its equivalent) with at least 50% marks and 2 year Diploma in Education (Special Education). OR Graduation and 2 year Diploma in Elementary Education / 2 year Diploma in Special Education. (c) Candidates must have Odiya as MIL up to Class-VII or Pass in Odiaya language test equivalent to ME standards conducted or declared by BSC (0). B.A, B.Ed. & B.Sc. B.Ed. Higher Secondary (+2 or equivalent) with at least 50% marks and 4 years B.A, B.Ed. / B.Sc. B.Ed. b) Pass in the Odisha Teachers Eligibility Test (OTET-Category-II). (c) Candidates must have Odiya as MIL up to Class- X.